As you can envision, I write these blogs, “after the fact”; I do make notes along the way but to sit down during the days I share gives me little to “no” time to reflect. Our last dive day was 26 May and it was the most intense of them all, south side of Kadavu with western swell; but more on that in a minute. 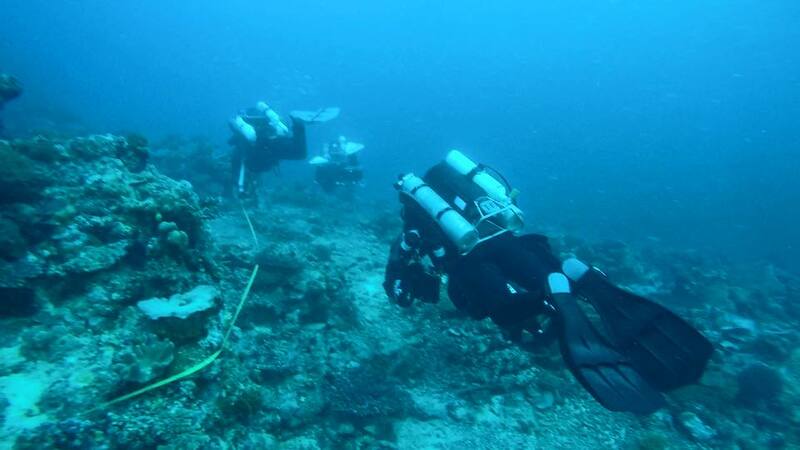 Once that dive was complete, 12 days on the Ad-Vantage and 10 big rebreather team dives successfully completed with one day, 23 May down due to weather, we spent about 4 hours cleaning, sorting and readying our gear for packing. Following that, I grabbed an iced tea and hit the upper deck to simply relax and as usual for a trip like this, I had a massive, for me anyway, personal insight. In looking at the stars of the Southern Hemisphere, which I have never before seen, it occurred to me that, “we are but sub atomic particles in a World, no Universe, of such immensity that all we can do, whether or not it is initially measurably impactful, which I realized it is not, is to do our best to reveal our dedication to an effort that we believe will benefit our World’s aquatic environments and in some way… lead others to become passionate about the environments in which they live and by this exhibition of our volunteer efforts, create a drive in others to act”. So I ask, “did we accomplish this insight”? Absolutely YES!. We demonstrated to a group of outstanding individuals, the crew of the Ad-Vantage, to local island dignitaries and the citizens of Fiji and to all of you out there, that everyone, regardless of their position on this earth, can be stewards of our aquatic environments and become sub-atomic particles that if split, could energize a movement that will be measurably impactful; I believe our work makes this possible. 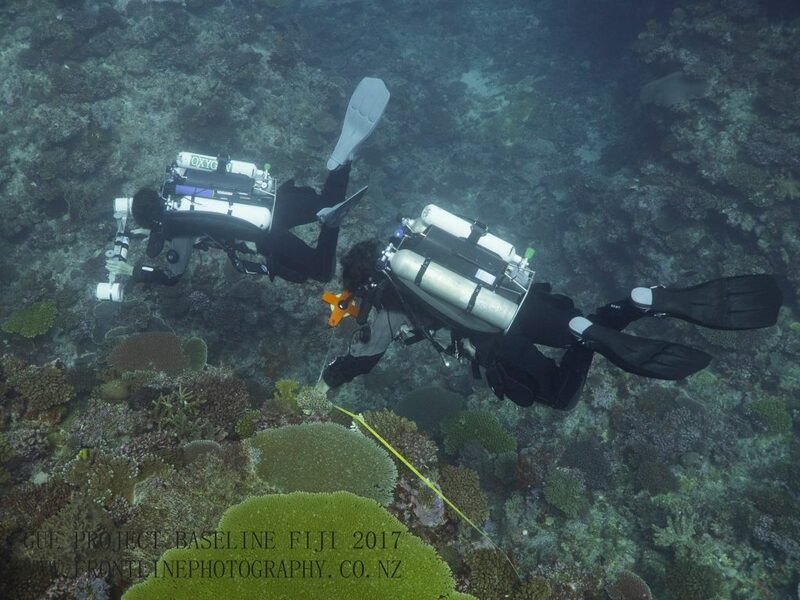 Mission day 10 (23 May) put us down due to extreme weather on the southwest side of Kadavu but Mission days 11, 12 & 13 were full and brought back more insight to the deep, mid and shallow coral reef ecosystems around Kadavu. 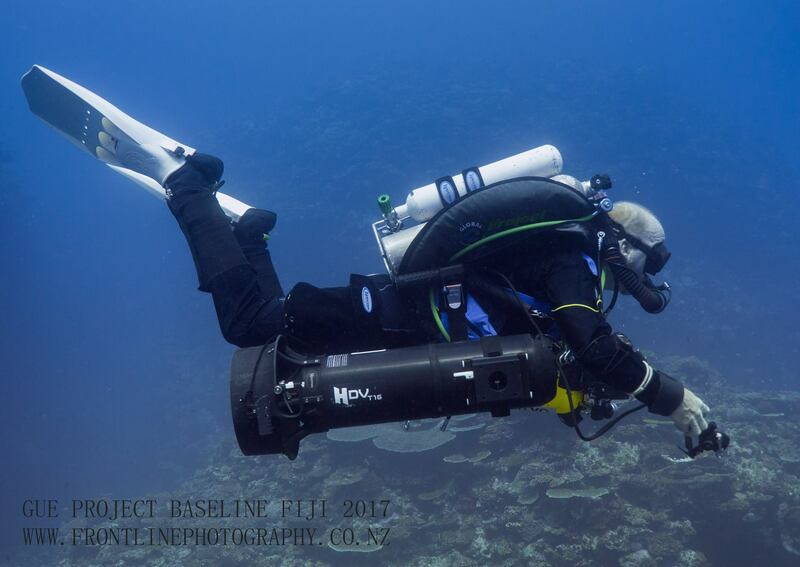 Originally as I mentioned, our daily project goal was to perform 3 dives; Science Dives (the scientist SCUBA dives); a Submarine Dive with Scientist and Fijian decision makers and my team’s rebreather dives. By Mission Day 11, we were in a real groove with the crew of the Ad-Vantage and were completing 4 dives; adding a second dive for the scientists. 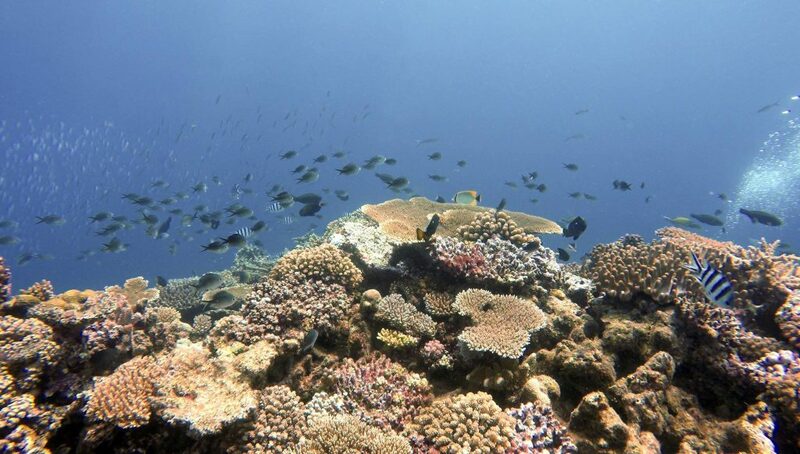 The Fijian Islands comprise over 300 islands and we barely touched a spec of this terrain but what we did touch, established the first ever “baseline” documentation of these reefs which are being negatively impacted. At 40m/135’-Moby with passengers (L-R) Ginnie Kincaid, Barry McGowan (Pilot) and Charles Messing. 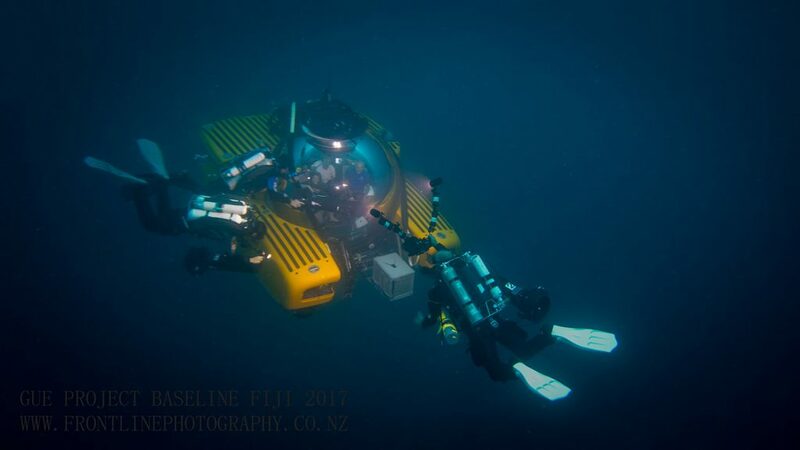 Rebreather team divers – touching the sub sphere is Todd Kincaid- Ginnie’s father, next to him is Mel Jeavons and me, filming the action. Photo Credit – Rob Wilson of Frontline Photography. 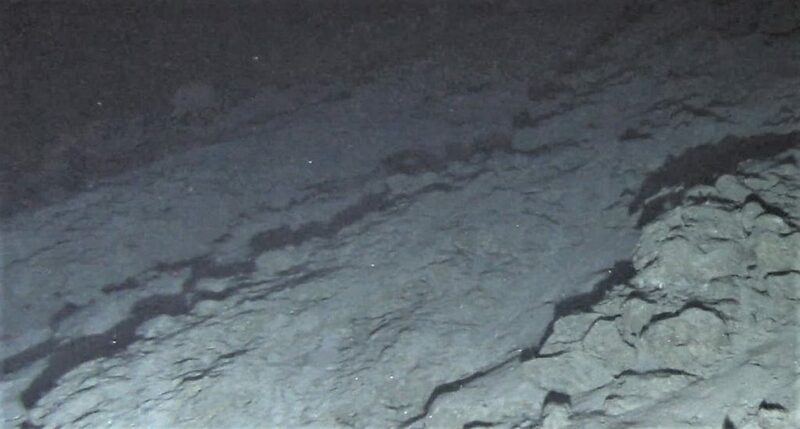 What was seen during these “deep” exploration dives? 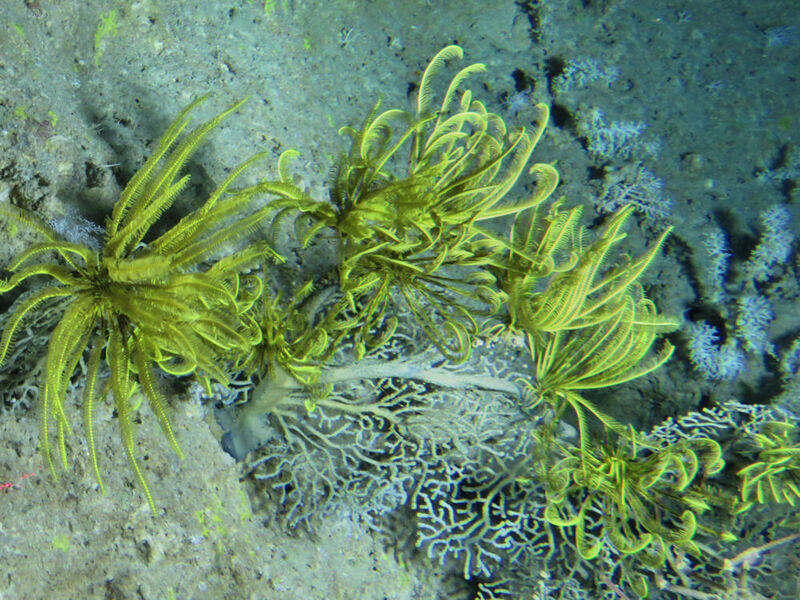 Deep down sloping ridges at 300m/1000’ – notice the lack of color and lack of large colonies of life. Photo: Charles Messing, Nova Southeastern University. Now pause for a moment…how many of us at the age of 9, got to ride for 3 hours, in a sub at these depths, with the coolest sub pilot ever to come out of Scotland and an incredibly informative scientist that had the patience and compassion to share what was being seen with a 9-year old? None of us I suspect; not me for sure! Think about how positively impacted this child, one of our future overseers (the generation that will carry forth our efforts creating measurable impact) of our World’s aquatic environments, was, after experiencing this ecosystem first hand. Do you think for a minute that she will not move forward the need to EXPLORE, DOCUMENT and PROTECT? This is just a part of what we do; and…why! To “share” with as many generations as possible what the present “baseline” conditions are and what opportunities exist to positively influence them. 10m/33’ and shallower. 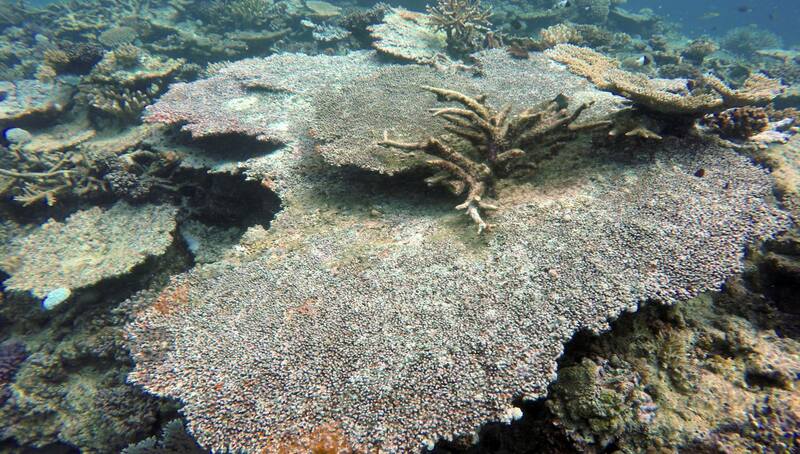 A very healthy shallow reef ecosystem. Photo: Brian Walker, Nova Southeastern University. The rebreather team, Mel Jeavons, Todd Kincaid, Jamie Obern and myself? Daily, we prepped our equipment, loaded it onto the Rupert, and with the support of our Divemaster, Ben, entered the water and fulfilled, with childlike excitement, our daily mission objectives of completing fish and benthic video transects at 36m/120’, 20m/65’ and 10m/33’, exploring and filming these depth contours and imaging reef conditions that seemed “out of sorts”. The RB team placing the metric measuring tape along the 20m/65’ contour. 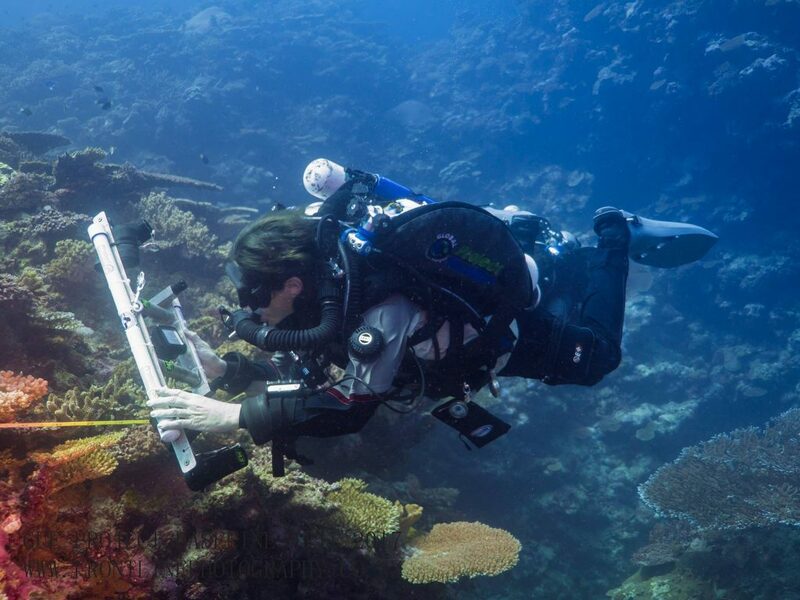 The RB team conducting the Stereo Video Survey along the 10m/33’ contour. Mel Jeavons in the lead with husband, Jamie Obern placing the measuring tape. Mel Jeavons conducting the Benthic transect at 10m/33’. Me watching over the team conducting the survey work. It is 28 May here in Denaru, Fiji (the marina area where the Ad-Vantage is berthed). Last night we celebrated the successful “proof of concept” mission that GUE’s Project Baseline set forth to accomplish with the m/y Ad-Vantage. Our Project Baseline teams exemplified professionalism in the performance of their respective mission objectives and worked seamlessly with the Ad-Vantage crew. The Ad-Vantage crew became to trust in our skill-sets, abilities and decision making experience in first and foremost placing the safety of all human resources at the top of the priority list; second, the incredibly expensive assets of the Ad-Vantage. Finally, doing all this with respect, courtesy, appreciation and patience creating a foundation for the success we realized. I return home on 29 May and have a family that I have missed tremendously. I will spend the week focusing upon and sharing my “Fiji” story with them and somewhere around the weekend of 3 June, I will post my final Blog, a trip reflection and summary.